It’s not the largest niche in tourism, but it’s one of the most lucrative. To see evidence of that, consider the many states that are investing in efforts to accommodate out-of-town cyclists. 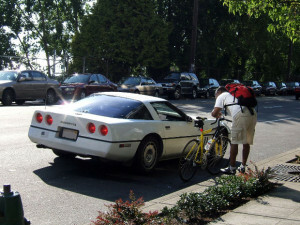 In Washington State, which for eight years straight has been dubbed the “Best State for Biking in the Country,” just committed $500 million more in federal and state funds over the course of the next 16 years to improve biking and walking in the state. In Florida, which is known as one of the most dangerous places for cyclists nationally according to data from the National Highway Traffic Safety Administration (NHTSA), officials recently approved $25 million to connect bike paths throughout the state to a new statewide network of interconnected cycling. According to The Seattle Times, researchers in Oregon determined that bicycle tourism in that state deposits $400 million every single year in the state state economy. That is roughly $1.1 million every single day. Again, that is just in Oregon. In Montana, which sees about 500,000 bicyclists touring the state every year, administrators with the Institute for Tourism and Recreation Research at the University of Montana found cyclists who are coming to visit tend to be older and wealthier. They spend more. While the average non-resident vacationer spends about $58 a day for six nights in Montana, researchers found bicycling tourists tend to spend about $75 a day and stay for eight nights or more. And they have a very small environmental footprint on the landscape. In other words, they are exactly the kind of tourists states want. That’s why after that research was published, officials in Montana set to work on establishing more bike-friendly roadways and camping spots in state parks. On average, states are spending less than 2 percent of their total transportation budget on biking and walking initiatives. But as some states are learning, there is a valid reason to invest more. Our Boston bicycle accident attorneys at The Law Offices of Jeffrey S. Glassman and bikeattorneylcom know that the Boston Bikes initiative resulted in more than 60 miles of bike lanes in the city, 1,000 bike rakes and the unveiling of the Balance Hubway bike share system – one of the first countries in the nation to do so. Additionally, there are plans to triple the number of biking, walking and mass transit trips between 2010 and 2030. A big impediment to that is the fact that many cyclists complain about the treacherous streets they have to navigate. That’s why state officials are currently studying bike paths that would be physically separated from both motor vehicles and pedestrians. Although these kind of lanes are common in Europe, you rarely see them here in the U.S. Although there is some controversy about whether this is the best approach, the fact that we have an ongoing conversation is important. If you or someone you love has been injured a Boston bicycle accident, call for a free and confidential appointment at 1-888-367-2900.